The ultrasonic diagnostic complex (UDC) for reception of two-dimensional acoustic images (AI) of the chosen sections of researched solid-state objects that define distribution of density of substance and speed of a sound in it, is offered and realized. On the basis of mechanical sector (MS) and linear electronic scanning (LES) AI of cross sections of cores of the triangular, square, cylindrical and tubular structures are received, which are taking place in water for maintenance of reliable input of longitudinal acoustic fluctuations in object. Also AI of pair friction such as "shaft - cartridge" at different modes of a loading are received, and program processing of these images by use of methods of overlapping of acoustic and optical images (OI) is carried out. Influence of the collateral factors, in particular direct and return transformations of longitudinal acoustic waves in cross, having place in firm bodies, on qualitative characteristics of the products received by AI is analyzed. Principles of program processing of AI by use of OI, consisting in a high-frequency, low-frequency and nonlinear filtration of the received echograms of s the purpose of improvement of their characteristics, receptions of the pseudo-color image are realized. The criterion of diagnostics of tribological properties of pairs the friction, consisting in reception of the integrated characteristics considered on the area and brightness of a contact stain on border of a body and a contra-body of pair of friction is offered. Acoustic tomographical visualization now is widely used in medical diagnostics [1, 2]. In too time the ultrasonic not destroying control also widely enough used for check of industrial products, is mainly one-dimensional, allowing to reveal those or other defects in them . At diagnostics of machine-building products and materials optimum it is necessary to choose working frequency of ultrasound piezoceramical transducer (UPT) and the electromechanical coordination of the converter of s researched object, a way of scanning and also to provide good acoustic contact. The account of these factors is determined by acoustic characteristics of a material of a product (an acoustic impedance, density, speed of a sound), a site of prospective defects or areas of the intense condition, a condition of rest or movement of a product, a kind and size of external loading on units of a product, its geometrical form and the sizes. Thus, for a concrete diagnostic problem, proceeding from set forth above conditions, choosing of required UPT and hardware and program adjustment of UDC for reception of optimum parameters received by AI is carried out. The basic adverse factor at ultrasonic diagnostics of solid-state products as against biological objects, are the cross waves arising at reflection of longitudinal waves, coming through the medium border (such direct and return transformation may occur repeatedly). By virtue of an essential difference of speeds of longitudinal and cross ultrasound in substance it is impossible to judge true coordinates of found out defect, that is generated by AI without additional processing and may give a false information about object. The problem of allocation of the true image in the theory of recognition of images is rather complex and we do not put here the purpose under its full decision. At narrowing the formulated problem when there is an information on the form and the sizes of the product and as about an arrangement of its researched areas, it is possible intuitively or by calculation to exclude the false information and to reproduce a true echogram. Despite of the marked restrictions, the ultrasonic echotomoscopy of machine-building products is represented rather important as the helpful information acts from all points of the chosen area of scanning as against methods of a ultrasonic non-destructive testing when only the points located along a chosen direction of distribution of an acoustic beam are informative. Moreover, there is an opportunity of reception of a series of the echograms received in real time, tracing such processes, as dynamics of development of defects and areas of the intense condition in a product, penetration of a liquid into a porous material etc. As at action of external factors on a product the change of true and false images on an echogram occur differently, their identification is possible. With the help of the chosen criteria (for example, on brightness of a stain of areas of defect or a loading) it is possible to determine quantitative values of parameters and to correlate to the tribological characteristics of a product. On the other hand, the false information received owing to presence of cross fluctuations, may appear useful as revealing of defects and areas of a loading different types of waves occurs unequally. For example longitudinal defect, with small width of disclosing and focused along a direction of a sounding comes to be lighted only by cross waves. At last, if in medical diagnostics we do not know precisely the form and the geometrical sizes of diagnosed body and required formation in it  in technical diagnostics such information is known for a design stage of a researched product. Thus, it is obviously possible to receive computer OI of object of s the help of a videocamera or the optical scanner, and due to scale transformation to combine it with AI on two chosen fixed points (for example, on the center of an arrangement of UPT and the point of a product nearest to it). The function chart of UDC is submitted on fig. 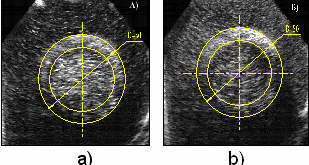 1 and includes the ultrasonic echotomoscope (ETS) consisting of UPT with mechanical or electronic scanning [4 – 6], electronic power units, units of management and preliminary processing of the information, the monitor, the videoadapter (VA) interfacing a target television signal of ETS with an input of the personal computer, the personal computer with the monitor, the printer and the modem . All actions on maintenance of functioning of UDC are carried out by the operator. The acoustic channel of UDC allows to receive at the first stage the AI on the ETS screen and will carry out the limited processing of images in real time which degree is defined by functionalities of ETS. We carried out mechanical scanning with corners of the review of 45°, 60°, 90° by s use of UPT having working frequencies of 3.5, 5, 7.5 MHz. Formation both one-dimensional and bidimentional images, and combined  is stipulated. Depth of sounding in metal was defined by attenuation of a sound, and in particular for aluminium made not less than 600 mm at use of UPT of working frequency of 5 MHz. Longitudinal resolution of the device, at the accepted speed of distribution of ultrasound in aluminium is 6100 m/s, is not worse than 3 mm with the gauge 3,5 MHz, 2 mm with the gauge 5 MHz and 1 mm with the gauge 7,5 MHz at revealing defects in a product with distinction of their density not less than 1%. Fig 1: The functional chart of UDC. where S1 and S2 - speeds of a longitudinal sound in different environments, f1 and f2 - frequencies used by UPT. The device provided separate adjustment of signals in three zones: near, average and distant. Rating values of factor of amplification on zones were displayed in a digital kind on the screen of the monitor. The number of levels of quantization of a signal in the device made 32 and was equaled to quantity of gradation of gray color at display of AI to the screen of the monitor. The device provided three programmed kinds of digital processing of the image. The principle of action of the device is based on a method of an echo-pulse ultrasonic location of the researched environment of s by mechanical sector (angular) scanning. Scanning UPT consists of the piezoceramical module (PKM)  which makes radiation of ultrasonic probing signals in the researched environment and reception of the reflected signals, and the special electric drive which provides controlled moving the module to the given sector of scanning. The accepted echo-signals are amplified (factor of amplification makes 70 dB), transformed, and in a digital kind are kept in memory of the converter of echo-images for the further transfer on the indicator of television type for display of echogramms. Where Zpc and Zro - accordingly acoustic impedances of a piezoceramic and researched object..
Let's note, that broadband PKM of UPT offered by us always radiated short acoustic pulses of t = 2T (T is the period of fluctuations) duration on a level of 6 dB that is caused by use of the appropriate piezoceramic and the undertaken measures on a damping of a piezo-plate and both its mechanical and electric matching with researched object. We offer change of a design of the sensors, consisting in use of contacting with a piezoelectric material of a layer of a magnetoacoustical material, for example hematite, in which strong dependence of speed of volumetric longitudinal (up to 10 %) and cross (up to 50 %) elastic waves from an external magnetic field  is observed. Thus there is a real opportunity to reconstruct acoustoelectronic parameters of the converter, i.e. resonant frequency, duration of the radiated pulse and its amplitude. The researched object was represented by a friction pair of the "shaft and bush" type. Bushes were made of OTSS-5-5-5 bronze and SCH25 pig-iron, and the 40H steel was used as a material of a shaft. The given materials have found wide application in sealing devices, bearings of sliding and other units. The diagnosed friction pair was established in the test chamber of the machine of friction 2070 SMT-1, filled with oil of I-40A mark. In the test chamber UPT for mechanical scanning was established in a plane perpendicular to axis of researched pair friction. As the distance from UPT to a surface of a diagnosed product made some lengths of waves of ultrasound for used working frequency, the acoustic impedance of agreeing layer got out of a condition that loading was not bronze but industrial oil. At use of LES it is possible to achieve direct contact of UPT and a surface of diagnosed object, if it is flat, through a thin layer of greasing. UPT with LES was a plate of a piezoceramical material of L=120 mm length, cut on 80 strip elementary converters which might function independently from each other. Power supply was carried out through the special electronic switching device, serially powered radiators of the given numbers. 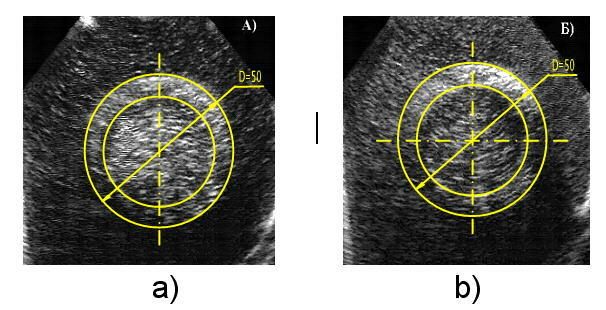 In result the rectangular echogram of section of a diagnosed product was observed. Compare of the received echograms of the same products with MS and LES has shown, that MS allows to receive echograms of s a little bit big resolution, but at the same time it demands the adjustment of an acoustoelectronic path of UDC and mechanical fixing of UPT, and also presence of a liquid backlash between UPT and object. The last in turn may have an adverse effect on sensitivity of UDC and raise influence of preventing factors on formation of a true echogram of a product . 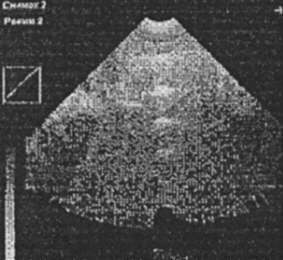 Received by means of UPT, without dependence from a way of scanning, the information acted in an echotomoscope of ETS-U-02, converted for realization of experimental researches of solid-state objects. The device is constructed with application of multilevel program management by all devices. The central microprocessor device operates the work of the digital converter of echo-images, modes of display of the graphic and alphanumeric information, makes calculations and displays the results of research. Local microprocessor devices carry out management of the electric drive or switching of the converter on type of scanning and provide interaction of the central processor of s by controls of the device. Structurally the device is made as a power unit located in the rack of the carriage, the block of management with the basic electronic components of the circuit, the monitor and the keyboard, which is used as remote. Diagnostics of immobilized machine-building products can be made at direct contact of the sensor and the surface of a product, or through a layer of the immersive liquid (used magnetic liquid which is kept by special magnetic system in a backlash between a rotating radiating surface of PKM and a surface of a researched product, is effective). Putting products into a tank with a liquid is also possible. At diagnostic research of products the optimum mode of processing of echo-signals gets out, proceeding from one - two adjusting measurements in those parts of a product which presumably less of all are subject to presence of defects and local zones of the intense condition. The choice of depth of sounding is carried out in all modes of scanning with displaying of its digital value. We shall note, that in one-dimensional mode the formation of an echogram is made on the direction chosen preliminary with use of the screen cursor. The converter thus is focused on a direction of the screen cursor and does not make oscillatory movement. For reception of acceptable quality of an echogram an opportunity of adjustment of amplification of capacity of an echo-signal is used. For maintenance of reliable acoustic contact of the converter of with the diagnosed product it is necessary to put on a working surface of the converter a contact layer (acoustic gel, vaseline, castoric oil, glycerin etc.). At the second variant of diagnostics there is the special magnetic system fixed on the sensor, in which aperture the magnetic liquid placed in its hole is kept by a magnetic field of a constant magnet, and thus creating qualitative acoustic contact with a controllable product. The third variant of diagnostics assumes placing of a controllable product in the special tank filled with a liquid (water, oil, spirit etc.). The choice of this or that variant of the control is defined only by the geometrical form of a controllable product. We used a converter way of displaying the accepted signals. In this case functions of storing and reproduction of the information are divided in time. Record of echo-signals in memory of the converter is made in time of ultrasonic scanning, and reading of the written information is made in time scale of a television signal. The converter used in ETS has sufficient speed for this purpose and brings the minimal geometrical and peak distortions (acoustic contrasts) at transformation of dynamic echo-images. Besides it supposed an opportunity to change a kind of scanning (sector, linear, rectangular, combined etc.) 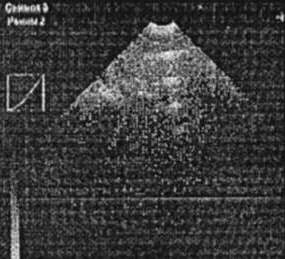 the transformed echo-image on an output at a constancy of linear-raster scanning of a television equivalent of an echo-image on an output. The important advantage of a converter method of display is the opportunity of repeated regeneration of an echo-image from memory that allows to realize a mode of the pause of video-stream, change of scale of the image, its broadcasting on significant distances, representation of the information on several screens, overlapping of an echo-image with the service information, change of structure of an echo-image. Processing of videoimages with use of modern high-speed personal computers is rather new area of information technologies, which now develops especially intensively [9, 10]. It allows using flexibly and in real time the information coded in video signal. In the given context, use of advantages of hardware maintenance of modern personal computers is represented in our researches rather perspective. Moreover, already existing base of software for images processing allows to improve essentially the characteristics of received echo-images, opportunities of their processing and as opens prospects on creation of the databanks containing received earlier and processed echograms received earlier. Opportunities of the modern personal computer in real time allow to trace the processes arising as at test of objects of friction, and other products to keep the received information, and then to carry out its nonlinear video-processing. Thus there are essentially new opportunities of construction of ultrasonic diagnostic complexes of s variable structure of the equipment appropriate to a concrete technical problem of diagnostics. The structure of AWNDT includes the full program complex consisting of the head program, library of subroutines, databases and statistics with an opportunity of a configuration, subroutines of the help and the description, and also files of adjustment of functioning of a program complex under MS Windows operating system. The program complex of processing of images may be essentially expanded with the additional software. With its help processing of images of with use of functions of the distribution having programmable or chosen weight factors, carried out by creation of pseudo-color, and also elimination of vibrations of UPT due to application of the low-frequency filter. We shall note, that program processing of the image may be increased and made as in real time, and at the subsequent work with the received image. The considered program complex allows to carry out viewing and archiving of the removed echo-images. Images kept in archive may be supplied with explaining comments. At processing images it is possible to use the following filters [11, 12]: median (smoothing, removal of pulse points); high-frequency (revealing of fine details, increase of contrast); low-frequency (removal of blinking, improvement of contrast); special (improvement of quality of the image by emphasis or allocation of its separate fragments on visual supervision); color (reception of pseudo-color). The high-frequency filter can be adjusted on concrete area of the image and to set necessary factor of contrast. Except for a filtration of images, it is possible to carry out measurement of distances between two points, measurements of perimeter and the area, including curvilinear objects. Before realization of measurement it is necessary to establish standards of length for various modes of operation of the ultrasonic device with diagnosed objects. Thus the choice of standards of lengths for four modes is possible. The available special filter enables a digital filtration of the image on one of 12 special mathematical functions of distribution with preset factors which are displayed on the screen of the monitor. As the unexercised human eye perceives only 11 gradation of gray color , an echo-image containing from 32 up to 256 gradation, is superfluous. For recognition of the given information it is necessary to programmable analyze the contents of the neighboring pixels of the image or to carry out transformation of a gray scale of the image to a color scale of a visible range of color. Last function is realized by the digital filter, programmable or manually adjusted according to this or that law of transformation of a color palette. Thus it is possible to make processing of both the image, and its separate fragments. Experimental researches were CMT-1 which is intended for studying of tribological processes in metals, alloys, rigid constructional, composite and ceramic materials. The principle of action of the machine consists in deleting pair samples, pressed to each other with force of P. The frequency of rotation of a shaft of the bottom sample is ranged from 75 up to 1500 min-1. A range of measurement of the moment of friction is 1 - 20 Nm, a range of measurement of efforts to samples is 200 - 500 N.
In a special aperture of the working chamber was established by UPT. It made 90, 60 and 45 degrees sector scanning of the chosen section of samples such as "shaft and bush". Thus, devices available on the machine of friction, registered frequency of rotation of the bottom sample and loading, and by means of thermocouples the temperature on various sites of a sample was measured. 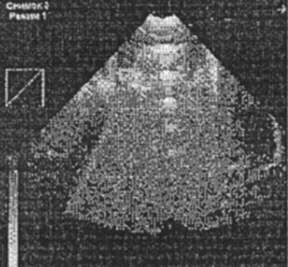 These data might be displayed on an echogram, both on the monitor of ETS, and on the screen of the personal computer. Fig 2: AI of friction pairs at various rotation frequencies and loading: a) – Loading P=0, rotation frequency n=0 min-1, gap h=0.1 mm; b) – P=0; n=500 min-1, h=0.1 mm; c) - P=4000 N; n=500 min-1, h=0.1 mm. AI received at realization of researches of friction pairs as immobilized, and at various frequencies of rotation of the bottom sample and loading are submitted on fig. 2. Whence it is visible, that the above-stated factors influence AI of the chosen section of a product. In medical diagnostics we do not know the form and the geometrical sizes of diagnosed body, but in technical diagnostics such parameters for a machine-building product are known precisely at a stage of its designing. Thus it is always possible to supply the computer with optical image (OI) of a researched cut of a diagnosed product with the help of a video-camera or the scanner, and with use of scale transformation to combine it with AI on two identical points. The choice of such points may be any. A unique condition is their exact concurrence on AI and OI. It is offered to choose the center of UPT and the point of a product nearest to it as such points of AI. For OI the first point is identical, and the second is defined proceeding values of speed of a sound in used immersive liquid. The situation becomes simpler at use of UPT with linear electronic scanning as it is direct through greasing with a product and thereof for overlapping two images on the screen of the display of the computer it is possible to choose extreme points of UPT as identical points of AI and OI. Let's note, that in a used range of frequencies attenuation of a sound both in a liquid, and in metal it is not enough. For example, at frequency f=10 the MHz, attenuation of a longitudinal sound in water a = 0,23 m-1 (2 dB/m), aluminium a = 0,26 m-1 (2,3 dB/m), steel a = 2,2 m-1 (19 dB/m). Thus at technical diagnostics full losses on transformation to an acoustoelectronic path of an echotomoscope are defined basically by double brought losses on transformation of UPT and an acoustic transparency of borders of researched object. The dynamic range of the amplifier of an echotomoscope in 70 dB has a sufficient stock as double brought losses on transformation did not exceed 40 dB for any of the developed sensors. Moreover, it is necessary to take into account, that from the generator of excitation electropulses of 200V amplitude are fed on UPT, and the reception amplifier gives out signals amplitude approximately 1 V for their subsequent DAC-transformation for the converter, i.e. 40 dB is added. Thus, in an acoustoelectronic path of ETS attenuation of signals may reach 110 dB and with the account of double brought losses on transformation and in neglect absorption of a sound in an immersive liquid and a product there are reserves not less than 70 dB for revealing non-uniform structure and local areas of the intense condition of products. So for border of water with aluminium (Zw=1,5׳106 and ZAl=17׳106 kg/m2s) at normal fall of an ultrasonic signal peak factors of reflection and passage to a product make accordingly R=0,84 and T=0,16. At reflection from the second border of a product with water the signal which will return on UPT, will make A=TxRxT or A=0,16x0,84x0,16=0,022 (33 dB). Thus the second border of a product may be revealed also. For border of water with steel (Zst=4,7׳106) similar estimations give: R=0,94, T=0,06, A=0,0034 (49dB). The given estimations show, that the dynamic range in 70 dB allows receiving images of back surfaces of diagnosed metal products. Moreover there is a reserve on the amplification, allowing to diagnose compound products from various metals also. In the object of friction representing a pair of friction "shaft and bush", it is possible to effectively diagnose a surface of their contact. If there are cracks or locally intense (deformed) condition in this area there is a bigger area on two - three order on the sizes in which the arisen pressure and deformations appreciablly change density and modules of elasticity of substance. As a result, conditions of reflection of a sound from such areas change, entailing also changes of a received echogram. As in developed UDC the echogram is represented as a matrix of 512 x 512 pixels of s 32 gradation of brightness we shall stop on the following technique of revealing of changes during research of friction pair. It is necessary to carry out program allocation of a rectangular on an echogram, containing the area subject to mechanical influence. Having determined coordinates Xi, Yi of points inside the specified rectangular we calculate brightness for all allocated area. Where N, M are quantity of points on axes X and Y of the allocated rectangular, brightness I (Xi, Yi) is the code of gradation of brightness of a pixel. Size I in standard units will represent brightness of all rectangular. Unequivocally determining influence of external factors. It is necessary to make two remarks. Inside the given rectangular it is possible to allocate the second rectangular of sizes N'xM' and if I (2,1) (P, v) (for addition of crossing of sets of points of both rectangulars) is constant, the first rectangular may be replaced with the second. Thus the specified process proceeds until will arise infringements of the above-stated condition. Thus, the size of the area subject to operational changes is defined. The rectangular may be replaced with other closed set of points. Owing to existing disorder in brightness of points of a matrix it is recommended to carry out statistical processing of echograms. Use of a method of imposing of OI on AI allows removing the handicapes caused by transformation of waves in a solid-state product. For reception of the graphic representation given on fig. 3, two initial images were used: AI and OI. AI represents distribution of density and speed of a sound in section of the researched object, received with the help of UDC and the appropriate software. OI was received with the help of the optical scanner and was imposed on AI with application of required scaling. Steel 40I was used as a material of a shaft, the bush was made of bronze IOS5-5-5. The given materials have found wide application in sealing devices, bearings of sliding and other units of friction. Industrial oil I-40A was used as working liquid. Experimental researches have shown, that at constant speed of sliding, with change of size of a loading, it is possible to observe dynamics of change of AI (see fig. 3). The further program processing of combined AI and OI by the above-stated technique allowed to reveal areas of the loaded condition with definition of their perimeters and the areas in more details. We offer criterion of a quantitative estimation of tribological characteristics of the rubed surfaces, consisting in summation of number of gradation of brightness of pixels of the allocated area of AI and establishment of correlation dependence of such size from acoustic and tribological parameters of friction surfaces. Thus, carried out researches allow to speak about an opportunity of use of developed UDC for technical diagnostics of friction details and units. After realization of researches, it is possible to draw a conclusion on an opportunity of revealing of areas of pressure in products and realization of measurements of their geometrical and acoustic characteristics. We shall note, that if the product is subject to influence of external factors (loading, rotation), varying its structure, then such change will be reflected on its AI, and it is possible to receive correlation dependence of tribological parameters with characteristics of AI. Thus, using received time dependence of a degree of deterioration of friction pair on external factors, it is possible to carry out diagnostics of a product during its operation. Combining the acoustic image of researched section of a product with its optical analogue entered into the personal computer by the optical technics, it was possible to vanish the influence of cross fluctuations inevitably arising in a solid-state product. The carried out researches of modeled products of a different structure and friction pairs such as "shaft and bush" at action of external loadings and change of frequency of rotation have shown dependence of the area and brightness of contact area on these external working factors. The appropriate software allowed to improve quality of the image with calculation of its characteristics and reception of pseudo-color of such areas. V.J.Domarkas, E.L.Piletskas. Ultrasonic echotomoscopy / L.: Mechanical engineering. The Leningrad branch. 1988. 267 p.
G.Kajno. Acoustic waves. Devices, visualization and analog processing of signals / M.: Mir. 1990. 656 p.
R.Kazhis, V.Dumbrava, L.Svilenis. Ultrasonic digital system for visualization of defects in non-destroying quality surveillance//Non-destructing testing. 1991. T.27. p. 104-115. V. Kosel, J. Kuzavko. Ultrasonic adjusted piezoceramical converters for diagnostics with the high resolution//Theses of the report at Republican conference "Scientific and analytical devices building". Minsk. 1995. p. 91-92. V. Kosel, Yu. Kuzavko. Manageable ultrasonic converts for the meolical diagnostic//Reports of International Conference " Computer methods and diagnostic ". Belarus. Minsk. 1995. P. 91-95. Yu. Kuzavko, H. Roth, V. Golovko. Ultrasound controlled piezoceramical transducers for medical diagnostic tomography//Proceedings of Workshop on Design Methodologies for Signal Processing. Poland. Zakopane.1996. P. 131-135. J.A.Kuzavko. Physical bases of a ultrasonic echotomoscopy of solid-state products//Theses of reports of International 52-nd scientific and technical conference of professors, teachers, science officers, post-graduate students and students of the BSPA " Technical colleges ‰ to republic ". Byelorussia. Minsk. 1997. Ya. A. Akulich, V.B. Gladyshchuk, M.V. Golyb, Yu. A. Kuzavko, B.N. Sklipys. Ultrasonic Diagnostic Tomography of Solid State Objects.//Reports of Second International Conference on " Computer Methods and Inverse Problems in Nondestructive Testing and Diagnostic ". Belarus. Minsk. 1998. J.A.Akulich, D.A.Kostjuk, J.A.Kuzavko. Acoustic researches of pairs friction//Works of the International symposium about a nature of friction of firm bodies "BELTRIB-99." Gomel. 1999. Ya. A. Akulich, D.A. Kostiuk, Yu. A. Kuzavko. Program Improvement of The Images in 2D acoustic visualization// "Proceedings of International Conference on Neural Networks and Artificial Intelligence". Belarus. Brest. 1999. U.Pratt. Digital processing of images. M.: Mir. 1982. Vo.2, 480 p.
Lim, S. Jae. To-Dimensional Signal and Image Processing. Englewood Cliffs, NJ. Prentice Hall. 1990.